In the Philippine capital, street vendors weave through tailbacks of traffic selling their wares. From basketballs to bonsai trees, snacks to phone chargers, there isn't much you can't buy from the comfort of your car. Manila's notorious congestion has become a way for people to make a meagre living, essentially turning the city's highways into a drive-through shopping centre. For Maria Eloisa Bantique, weaving through the queues of cars belching exhaust fumes to find a driver keen on buying knick-knacks is a necessary means of making ends meet. The mother of seven is one of many street vendors turning what is otherwise a drain on the country's economy into their main source of income. "I'm here in the middle of traffic because it's my family and children's livelihood. 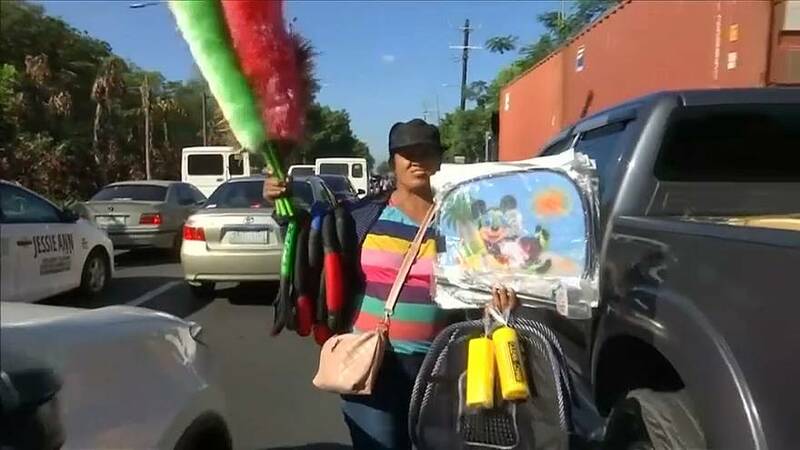 I am only a simple vendor but I am not ashamed of being a vendor," she said, while holding a collection of feather dusters and a Mickey Mouse-themed car window sunshade. "Some people don't have the time to go to malls, that's why – maybe because they're so busy with their work – when they see us, they buy the things they need from us." Metro Manila, a sprawl of 16 cities fused together by outdated infrastructure, is creaking under the weight of millions of vehicles, owing largely to economic growth of more than 6 per cent a year since 2012. Urban rail coverage is limited and trains are prone to breakdowns. Street vendors are technically not allowed to be on the main highways, but traffic police tend to turn a blind eye. Some residents of the capital complain that the vendors contribute to the slow-moving traffic, but they themselves disagree. "For us, we don't think we're obstructing anyone because when we know it's time to move, we all walk to the side. Why would we still be out there when it's time to move? We could die in the middle of traffic," said Bantique. Street vendors, selling anything from car accessories to snacks, basketballs, and even bonsai trees, have become an integral part of the urban landscape. "Here, it is made so easy for us, and it at least allows us to help others who are trying to find a living out here on the road," said one driver, Edwin Manolo, after buying a cable to charge his mobile phone. Bantique says street vendors in Manila earn an average of €8.90 ($10) a day, just above minimum wage, although getting that on any given day is never certain. The custom of haggling makes things extra difficult, particularly for those who opt to sell more unique items hoping for higher returns. "It's important not to have a hot head. When you look at them and they don't seem to be interested, you go away and move on to someone else," said Jojo Tarog, who sells bonsai trees, adding: "Always smile. When the customer sees you smiling, they'll be smiling, too."